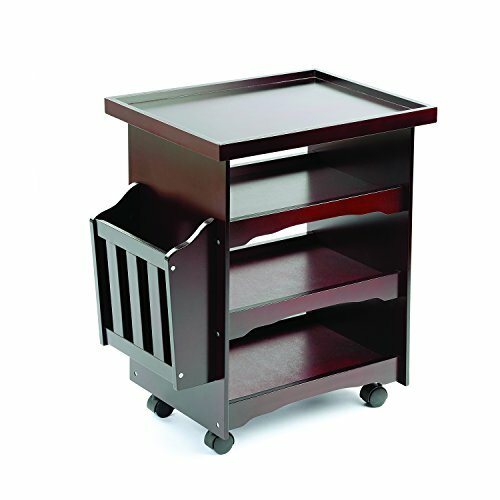 Enjoy generous storage space in our versatile and handy 4-tier multipurpose wooden rolling cart. With 4 smooth rolling wheels with locking option, this rolling utility cart easily moves with you for use in any room or stays put and is perfect for small-spacing living! 4 roomy trays are perfect for keeping items organized and easy to find. Stylish mahogany wood goes nicely with any home decor. Measures 24"H x 21"Long x 14"Deep. Assembly required. Ideal for magazines, newspapers, books, glasses, service cart, food cart and more! View More In Bar & Serving Carts. If you have any questions about this product by Utility Carts, contact us by completing and submitting the form below. If you are looking for a specif part number, please include it with your message.